We usually make coleslaw at our restaurant with cabbage. However last Saturday the farmers’ market, the one that we hold in our restaurant’s parking lot, had kohlrabi. It is something I’d never heard about before living in Minnesota. I thought it looked really strange, kind of like a little alien with lots of arms. Since it is not an alien, but an abundant crop this time of year, I did a little research and found this picture and helpful information from Sweetwater Organic Community Farm in Florida. I heard farmers’ market patrons as well as restaurant customers proclaim that they love kohlrabi. I’ve asked them how they like to prepare it. The most common response…just bite into it like an apple. 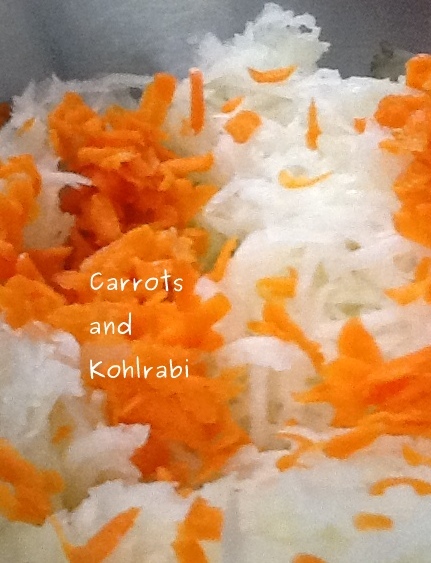 For our FarmerChef special on July 4th we re-thought the idea of doing a patriotic recipe and kept it simple by making a slaw with kohlrabi added together with scallions and carrots from the garden. Peel the thick skin off the kohlrabi and cut into pieces. Then grate with either a food processor or by hand. Peel and grate the carrots. Rinse and cut the scallions on the bias. Combine the rest of the ingredients in a separate bowl. Then pour over the veggies and mix well until all have been coated. Have you ever eaten kohlrabi? What kinds of dishes do you like to make with kohlrabi? kohlrabi reminds me of an extraterrestrial too! We picked our first one from the garden two nights ago. I decided on a slaw also, but yours looks tasty! Thanks for a new recipe for this new unfamiliar vegetable! Thanks for sharing. I so appreciate reading your perspectives of motherhood and gardening on your current post. Both: growing kids and growing veggies ultimately change a person. Funny enough… the first time I tried a kohlrabi was last year. I was hooked. My favorite thing to do with kohlrabi is peel it, cut it in small sticks and eat it with real creamy peanut butter. Second favorite is with guacamole and salsa. And I’ll definitely try your slaw! Yum! Any way to eat peanut butter is a good thing. Do you think it is a Tharp family thing? We were raised to eat peanut butter on a spoon for a snack. Thanks for the comment. We had so much fun touring your farm today. We watered our two new little plants right when we got home and will plant them in just the right spot soon.